How are people getting their photos onto social media sites? Since the invention of smart phones, uploading photos directly onto your social media site has become as simply as a click of a button. The ease at which people can upload images brings forth many questions. TSMRI Social Media Coordinating Intern, Monica Pierce, went out and interviewed people to see which ways they upload images. 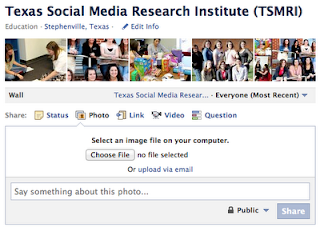 Marianne Salinas, a Tarleton Nursing Major, still uses multiple forms of photo editing for her online uploads. “I would say I do an equal amount between my phone and home computer... edited photos come from my PC, straight up plain pics come from my phone,” said Salinas. Some are not concerned with photo editing. Take Matt Mears, a Tarleton Biology student, for example- “I just hit the "photo" button for Facebook, or the "Upload Picture" button elsewhere. There's another way to do it?” said Mears. Brittany Tarchala, a professional photography in Missouri, still feels the need for some meticulous editing before photos are posted. “I like control over mine so I use Photoshop to do any edits and to re-size and sharpen for a friendly web view.” Tarchala says that will add the edited images to an existing album and "publish" or add to a new album. “The exception would be mobile uploads,” Tarchala. Many people no longer have actual cameras and so smart phones are making photo uploading possible. “I do use a smart phone but I don’t use an app to upload. I don't have a camera anymore so my phone is it,” said Laci Grizzell, a Temple College student. Brooke King, TSMRI Social Media Intern and Tarleton COMS Major, said that she has been using the App Instagram more and more. In fact, Instagram is becoming a commonly used tool for editing photos and uploading them directly to social media. So what is Instagram? The best part of Instagram? It’s FREE!! For those of you that are OK with spending a little to get a great photo editing tool. We suggest buying the Camera+ App for $1.99. 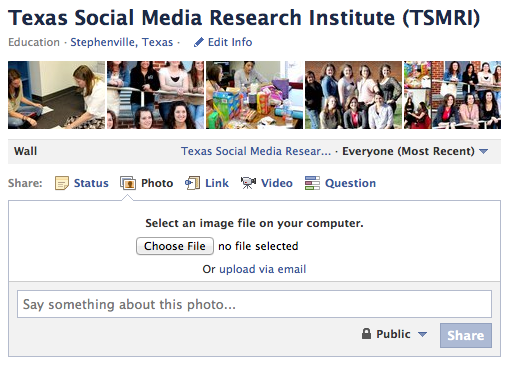 Megan Matthews, a previous TSMRI Intern and Tarleton Graduate, said that she prefers to camera+ to add filters to her pictures before she uploads them to Facebook. For those of you that are concerned with your public image, you might take some advice from TSMRI past intern and current Legislative Assistant Intern for Representative John "Judge" Carter, Kelsie Ray. “No easy uploading app here! Since I began working in a political office, I have decided to put my pictures go through a rigorous selection process before going on the web. This saves everyone from negative publicity. I use a tangible camera whenever I can. My camera is small, but it is higher in pixels than my phone,” said Ray.